Annette Marie | The Guild Codex: What's your Magic Class? Do you wield the power of the elements, commune with ancient spirits, or treat with the most sinister demons? In the Guild Codex world, there are five classes of magic, each with different powers, attributes, and weaknesses. The first thing Tori must learn in Three Mages and a Margarita is who packs the biggest punch. Would you like to know which magic class you belong to? I put together this fun little quiz so you can find out! SPIRITALIS – Your calling lies in nature among the spiritual beings that share our world: the fae. You’re probably a witch and interact with fae through ritualized exchanges. Or you may be a rare druid, as drawn to fae as they are drawn to you. You have the potential to cultivate intimate relationships with fae and gather great power to yourself—if you survive long enough. PSYCHICA – Masters of the subtle magic, psychics possess a power that falls in one of three categories: Mentis, which are abilities that affect the mind; Acuitus, which involves enhanced perception; or Viris, which are abilities that manifest physically. Whether a telekinetic, mentalist, or diviner, you’re often underestimated by the other classes, but that doesn’t make you weak. Find the right skill niche and your power will be highly valued by many guilds. ARCANA – Harness the natural energies of the world through complex spell casting and produce amazing—or deadly—results. As the most varied and powerful magic, Arcana users choose to study in one of three orders: Sorcery, Alchemy, or Healing. And expect to study! Your apprenticeship will take around 15 years, and you’ll need to memorize runes and incantations, learn ancient languages, and study intricate spell constructions. DEMONICA – This class attracts those willing to sacrifice it all for their ambitions. You could be a Summoner, one who’s studied the ancient rituals that can summon a demon into the earthly realm and bind it into a contract. Or you’re a Contractor—the one holding the demon’s leash. You might command a beast more terrifying that any magic-user, but that’s a dangerous place to be. ELEMENTARIA – The class of mages! Wielding powerful elemental magic, you command respect in the magical community. Cast magic with your bare hands or channel it through special weapons. Among the most powerful magic users, your class is also the most physically demanding. Your powers will exhaust your body, so expect to train day in and day out to stay in tip-top health and fitness. 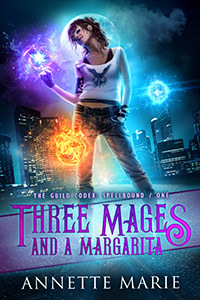 If you’ve missed the prior Guild Codex blog posts, check out the Cover Reveals and Meet the Cast of Three Mages and a Margarita.